The largest organ of the human body isn’t on the inside—in fact, it makes up our outermost layer. Skin, along with being the largest organ, is the border that separates what is you from what is not you. It’s a protective casing that covers your entire body (the amount of skin on the body of the average human adult stretches more than 20 square feet and weighs roughly eight pounds!) and does a long list of critical jobs that keep you alive. Along with keeping your insides on the inside, your skin shields your fragile internal organs from inhospitable environments. It helps regulate your body temperature by keeping you warm when it’s cold and cool when it’s hot. It contains the nerve cells that create your sense of touch. It keeps out microbes like bacteria that might make you sick, and, importantly, blocks harmful ultraviolet (UV) radiation from the sun. 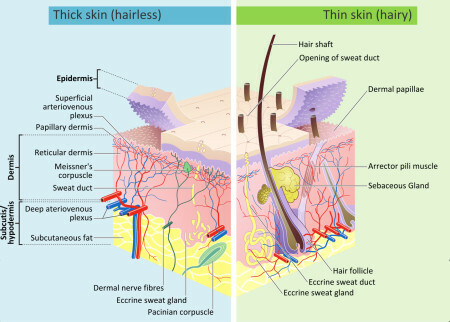 A diagram of epidermal hair follicle development, as affected by the thickness of the epidermal layers. Creative Commons license. Unfortunately, protecting your internal organs from UV rays comes at a cost. Anyone who has forgotten to put on sunscreen and spent a little too long outside knows the symptoms that appear when damage has occurred: your skin becomes tight, painful, and burnt. But while sunburns are painful and unsightly, they are far from the most dangerous aspect of UV radiation. After the sunburn fades, severe UV radiation damage and/or long-term sun exposure can alter our DNA and cause us to develop skin cancer. Sunlight travels from the sun to the earth in roughly eight and a half minutes—covering a distance of almost 93 million miles—before coming into contact with the earth’s atmosphere. It provides the energy that powers all life on earth, but at a cost: the sun emits powerful radiation that can damage the body. Sunlight is made up of three types of harmful rays: ultraviolet A (UVA), ultraviolet B (UVB), and ultraviolet C (UVC). Ultraviolet C has the shortest wavelength and is the most powerful and potentially harmful; good thing UVC rays are absorbed in the ozone and don’t make it to the surface of the planet in large enough doses to have an impact on our skin. Diagram of ultraviolet radiation from the sun. Creative Commons license. UVA and UVB are a different story, though. 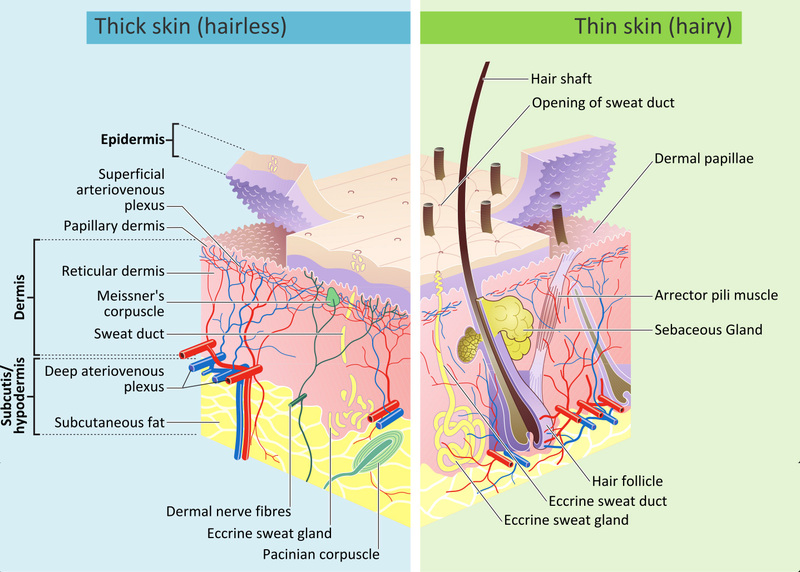 Both make it through the atmosphere in tact, and both can be harmful to your skin, including increasing your risk of developing skin cancer. UVA radiation, made up of rays with the longest ultraviolet wavelength, penetrates deepest: into the cells of the dermis. 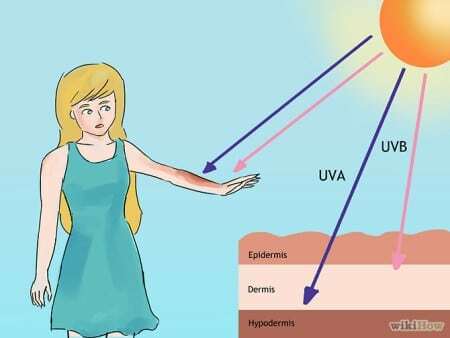 UVA is what gives people a tan (excepting those with lighter skin, who simply burn). It also causes premature aging and suppresses the immune system. UVA also alters the DNA of skin cells in the dermis, making it more difficult for your body to fight off cancer-causing changes. UVB radiation has a shorter wave length and doesn’t penetrate as deeply into your skin, but can cause more direct tissue damage. Overexposure to UVB rays causes sunburns and damages the epidermis—the visible top layer of the skin. UVB intensity varies geographically, and may be more or less intense depending on the season and time of day. 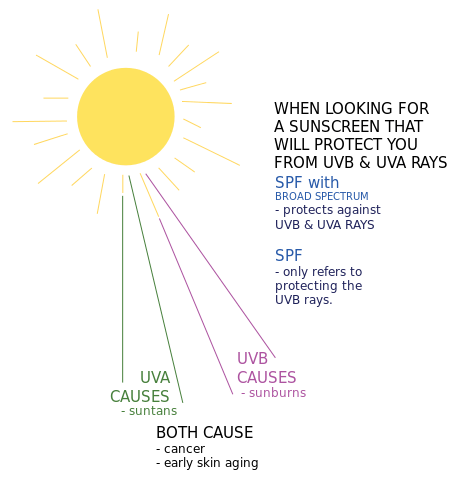 UVB rays cause sunburns, which may damage and alter the DNA of skin cells, significantly increasing the risk of skin cancer. 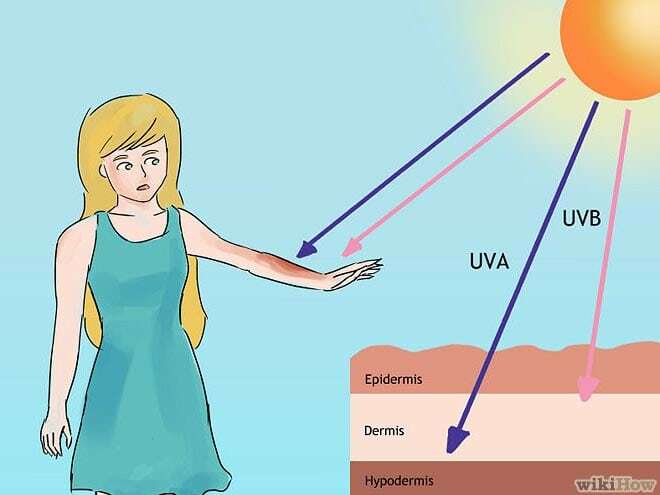 Unfortunately, any exposure to ultraviolet radiation—whether from the sun or from a tanning bed—will damage the skin and increase risk of skin cancer. Avoid exposure to the sun between 10 a.m. and 4 p.m.